I have always loved my father. Since the day I was born, along with my mother, he has been dedicated to the unselfish act of raising me with unconditional love. He has always graciously given himself to make sure I was provided everything I was needed, and he sacrificed a great amount of time to insure I was taught morals and integrity. Because of him, I have grown up very protected and nurtured, and for the most part he has been a support system that many of my fatherless friends envied. But even now, as a thirty-eight year old man, I cannot seem to get over an incident that occurred when I was about seven years old, which portrayed my father as disheartened and, in the midst of anger, disturbingly insensitive. He and I had always been animal lovers and considered the pets we had as members of our family. From the goldfish to the rabbits, to the pregnant stray cats we smuggled into the basement behind my mother’s back because she hated cats, to the dogs that we raised and trained from puppies, having animals was always a very important part of our lives—even to this day. 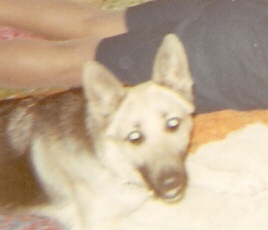 My first pet was a beautiful and obedient German Shepherd named Daisy. When I was born, she had already been a part of my family for a year after my parents adopted her as a six week old puppy, and she and I had practically grown up together. She fully developed massively into one-hundred or more so pounds and she effortlessly dragged me down the street on most days when I took her for long walks. She was my constant childhood companion, always protecting me with her intimidating growls and her formidable barking when the bullies of my neighborhood teased me with cruel invectives. All they were permitted to spew at me were their demeaning words and violent threats, but that was it; Daisy never allowed them to get close enough to me to physically fulfill any of their threatening rants. She snuggled next to me on many nights when I fell asleep on the living room throw rug watching TV, and with undying loyalty, she slept on the floor next to my bed and would not leave my side until I awoke.